Just days ahead of the COP21 climate change talks, Pope Francis is set to address the ethical issue of climate change again. Activists hold up a banner as Pope Francis’ visit to the US. Photograph by Susan Melkisethian. As part of Pope Francis’ trip to Africa, he is set to visit the headquarters of the United Nations Environment Programme (UNEP) in Nairobi on 26 November. This visit will come just days before the start of the seminal COP21 climate conference in Paris. Speaking from the heart of Africa to the world, the Pope is expected to again address climate change, an issue central to his tenure as Pontiff so far. The Pope is in a unique position. As head of the smallest country in the world, his ability to legislate on climate change may have limited impact. But his religious authority speaks to 1.2 billion Catholics around the globe and to even more who look to him as moral leader. He has imbued the climate change debate with an ethical element that ties environmental issues to his vision of a just and equal society. His leadership on climate change has therefore had enormous impact. Most other world leaders are in the inverse position. 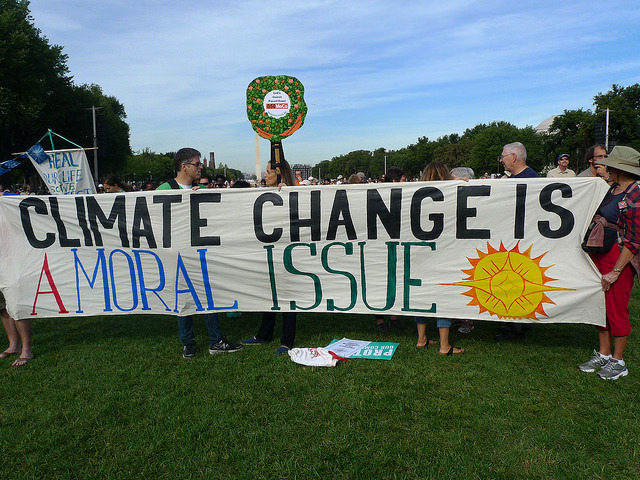 They may rely less on moral authority, but often possess a distinct legislative ability to concretely address climate change. So far, national governments have made greenhouse gas reduction pledges of varying ambition. An analysis of current pledges in UNEP’s Emissions Gap report has shown that the forecasted global temperature rise will still be upward of 3°C with these commitments. The pledges are an encouraging departure from business as usual, but this still marks an temperature increase with severe consequences for the planet and its peoples. Nations will have legitimate differences in Paris, but these should not stand in the way of a meaningful outcome. As we arrive at COP21, we need bold and assertive leadership that will help us overcome these differences. After all, the agreement on anthropogenic climate change from all corners of society is a consensus unprecedented in history. Science and religion agree. The private sector, the finance world and consumers continue a vocal drive toward sustainability. Citizens from the wealthiest to the poorest are anxious about the impacts of a shifting environment. And many local and regional governments have committed to act. Since 1896, the scientific community has provided ever more data on the impacts of anthropogenic climate change. Current scientific models predict a future of climate change effects none of us wish to contemplate. Nor will we wish to reflect on a past when we had the choice to act but didn’t. Where scientists have approached climate change with figures, religious leaders have made it an ethical issue. Pope Francis has said of climate change that “decisive mitigation is a moral and religious imperative for humanity”. His clarion call was echoed by Islamic leaders in August, when signatories to the Islamic Climate Change Declaration called for all countries to phase out greenhouse gas emissions as soon as possible. Buddhist and Hindu leaders have made similar appeals. Recognising the growing risks of inaction, institutional investors have begun to divest their portfolios of carbon-intensive assets. The Portfolio Decarbonization Coalition is a group of investors who have pledged to divest themselves of $100 billion-worth of these assets by year end. They have already surpassed this goal. Businesses have recognised the future costs of climate change, consumers’ demand for sustainability, and the corresponding opportunities. Technologies such as Kenya’s enormously popular M-Kopa which provides on-demand solar-generated electricity, have shown the economic potential of climate change mitigation initiatives. Civil society and NGOs have been vocal in emphasising the disproportionate effect of climate change on the world’s disadvantaged and poor, who are most vulnerable to its impacts. Their message ties directly with the message of Pope Francis, that addressing climate change critical to combatting inequality and social injustice. Local and regional governments meanwhile have taken heed of the warnings and are beginning to make changes. The C40 network of cities, representing over half a billion people around the world, is working on strategy to address climate change. Regional governments have taken steps as well. In California, the state has mandated an 80% cut in emissions by 2050. Many strong words from global leaders have been uttered on the need to address climate change. But the time for declarative statements has passed. The window we have to take action is closer to shutting entirely with every year that passes. Leaders are not simply companions to the process at COP21. They are the ones who have the power to signal to the world with concrete plans that anthropogenic climate change can and will be stopped. Pope Francis has emphasised the relationship between humanity and nature and has called for action to protect our common home. We echo his call. We have a consensus as to the centrality of climate change to our common future. What we need now is ambitious action and courageous leadership at the highest levels. Achim Steiner is Executive Director of the United Nations Environment Programme (UNEP). Catholics can disagree with Pope Francis on climate change.